When Jen Fitzpatrick joined Google's first intern class in 1999, there were 17 employees. The company was barely a company, much less a verb or a cultural phenomenon. The search engine was not nearly as popular as, say, Yahoo or Ask Jeeves. Fitzpatrick had to explain the search engine to her parents. Over time, what was meant to be a stop before grad school became her only adult job. In the 19 years since, she's worked on user experience, search, advertising and Google News. Currently she's vice president of Geo and Google Maps, which includes Google Earth and Street View (but doesn't include Waze). Maps started about 10 years ago with renditions of streets and landmarks. Just as smartphones pushed Maps into navigation, enabling voice dictation has led to more complex questions. 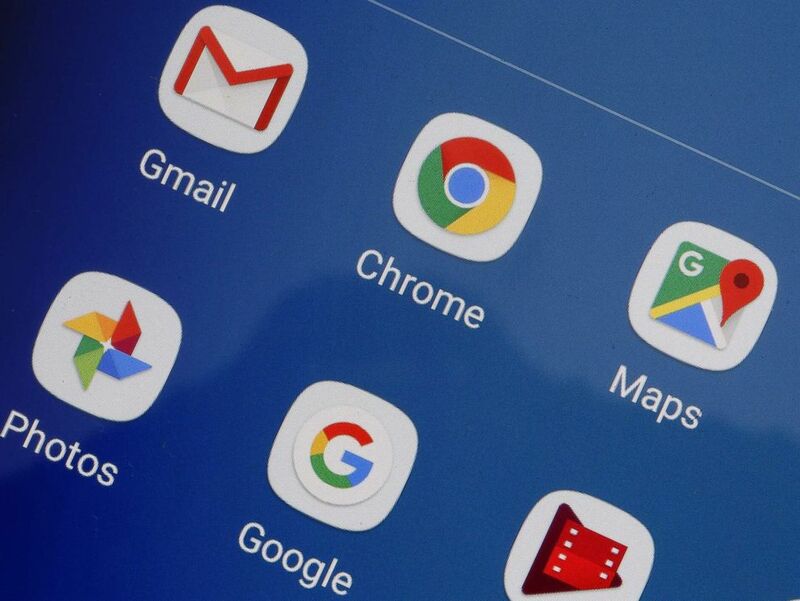 Gmail, Chrome, Google Maps, YouTube, Google photos and Google are displayed on the screen of a tablet, Oct. 23, 2018, in Paris, France. "It’s much easier and more natural to ask a long, hard, complicated question when you’re speaking out loud than it is when you’re awkwardly typing with your thumbs," Fitzpatrick told reporters in an interview at Google's New York offices. Now Maps is moving toward being a virtual assistant, whether it's finding a restaurant that serves pancakes at 2 a.m. or booking an appointment at a hair salon, recommended by Google's Local Guides. That's the direction Maps is going: offering active suggestions and guidance versus a tool that's reactive to user queries. Fitzpatrick spoke about the unconventional uses for Maps, Maps v. Waze, take down requests and diversity in Silicon Valley. A man reportedly caught his wife cheating via a picture on Street View. Are there other weird, human things that have happened because of Google Maps that maybe you didn't anticipate? We had a period of time a few years ago where someone was trying to follow the Street View cars and sort of get caught doing funny things on camera just for the sake of it. You hear things like that on occasion. But in general, license plates are blurred, faces are blurred, the intent is to capture the buildings and roads, the information that people want to know. There’s a lot of people -- you’re bound to catch people doing people things. About diversifying Silicon Valley: what can be done to bring more women into positions like yours? I don’t think there’s a single or simple answer. You can go back to the stats around pipeline and other things, and there’s genuine issues there that you can trace back to computer science education, science education, gender issues in society, right? There’s definitely a set of compounding things there. I think if you look more at the tech industry in general, my personal view is it’s a great time to be a woman in tech. The amount of flexibility you get is not necessarily widely understood or appreciated. I have three young kids. Relative to friends and peers I have in other industries, I feel like I have a lot more flexibility. One of the things I talk a lot about is building a stronger culture around positive feedback. I think whenever you’re in the minority in anything in life, it’s easy to find moments where your confidence wanes. And I think that one of the things I talk a lot about is how do we build even stronger cultures of positive feedback and reinforcement, which I think can go a long way in those moments when someone is having a temporary crisis of confidence, to bump them up and help them ride it through. That’s obviously not an answer to 'How do you fix gender [disparity] in Silicon Valley?' That’s a much larger topic but I do think there are signs of progress and I do think that there are small things in addition to large, systemic ones that can help along the way. Google Maps recently changed so that the Earth is now round and not flat when you zoom out. [The change happened Aug. 2] It used to be the Mercator projection, the flat Earth which makes it look like Greenland is giant and Africa is way smaller than it is. Any good mapmaker knows that's not an accurate depiction of the world. It always bugged us and we got an engineer who got motivated to go make it round. How do you stitch together the photos the Street View cars take? We have very good computer vision engineers who do a lot of hard algorithm work to understand lines and edges who computationally stitch them together and remove all the seams. Basically, fancy algorithms. I mostly use Google Maps, I admit. Waze tends to be more aggressive about taking you off the beaten path and even with the goal of saving you a small number of minutes. If there's a major time-saving opportunity or if there's a major incident to get around, Google Maps will re-route you in real time. Waze tends to be more aggressive about routing you onto those little side streets. Do you get requests to take down or obscure information from governments or companies or individuals? We do get periodic requests from various governments around the world, usually around things around imagery and our general approach there is to comply with local laws. If there are laws in place we will follow them. If they're opinion-based, we're in the land of subjective debate. We try to engage and understand what the concern is but generally speaking we try to stick to local law as the best guide of what we use.